Fish are nice, corals are pretty. But if you want something with a real personality for your aquarium, I’d like to introduce you to a creature that’s sure to entertain. With its exotic look and graceful-yet-gawky movements, few aquarium specimens are as charming as the arrow crab. 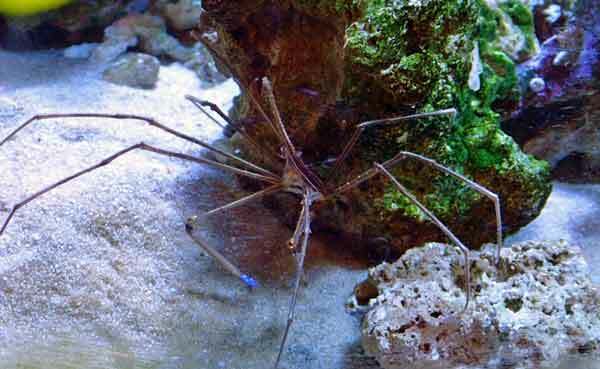 The arrow crab is a fun and fascinating addition to a saltwater aquarium. It’s striking appearance, with long spindly legs and its long, pointed beak, or rostrum, make the arrow crab a beautiful counterpoint to other aquarium creatures. It has to be one of the most alien looking invertebrates found on coral reefs, which is why it is such an awe-inspiring addition to any reef tank. Its fast movements add to its interest, and the species can even be helpful in controlling bristle worm infestations in an aquarium. But the arrow crab won’t be a perfect fit in every saltwater aquarium- its predatory and territorial nature can become problematic in some situations. The arrow crab, scientific name Stenorhynchus seticornis, also known as the yellow line arrow crab, is aptly named for its body shape, as you can see in the image below. A long, slender body and eight enormously long legs (up to three times its body length) are its most obvious characteristics. The body is cream to yellow colored, with black, iridescent blue, and white stripes. From its appearance, it’s easy to see how it earned its name. Along with several other species, it is also sometimes called a spider crab, which is fitting since it might easily be confused with some of its distant arachnid cousins. One of its most surprising features is its rostrum- the long slender spike that protrudes like a unicorn’s horn from the head. This long “snout”, flanked with buggy eyes gives the arrow crab an unforgettable and almost comic face. Stenorhynchus seticornis are native to coral reefs throughout the Atlantic Ocean’s tropical and subtropical coasts, from the southern United States to South America, but especially in the Caribbean. They thrive in coral waters 10-30ft deep, but some have been found living much deeper. Arrow crabs are scavengers and will eat virtually any piece of dead material they may find, but they can also be predatory. The arrow crab’s natural quarry is small reef-dwelling invertebrates, especially small duster worms. Arrow crabs are opportunistic predators, and will also eat small crustaceans and slow fish as well, or pick at coral polyps. Arrow crabs are often found living among the tentacles of anemones or hiding out in small crevices and caves. S. seticornis begin life hatching from an egg. After fertilization via a sperm packet transferred to the mother by a male, the eggs are carried attached to the mother’s body until they hatch into larvae. The larvae feed on plankton at the water’s surface, growing larger and larger, before finally undergoing metamorphoses into an adult form. Adults can live a year or more in captivity, and continue to grow. If you are considering adding the arrow crab to your saltwater aquarium, there are several considerations you will need to think about to make sure it will acclimate well to life in your personal slice of the reef. Although easy to care for, arrow crabs are predators and may become a killer of your other prized fish, crustaceans, or coral if it gets too hungry. Be sure your aquarium has lots of rockwork with suitable crevices and holes for the crab to hide in. Stenorhynchus seticornis will love crawling about the aquarium at night over rocks, corals, and the bottom of the tank. It will tend to hide under fan corals and any other type of shade or overhang during the day. 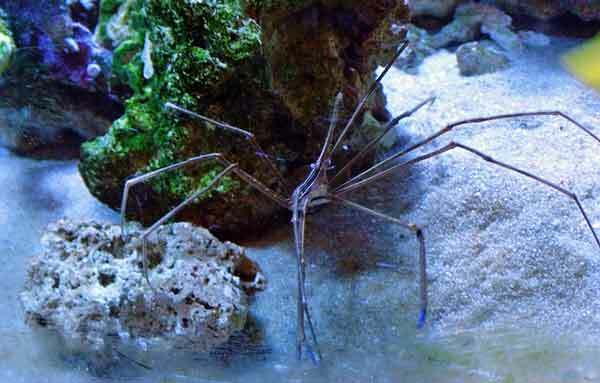 In short, an arrow crab will do best and look best in an aquarium with a three-dimensional look and plenty of cover. Think tunnels, ridges, and ledges for the crab to explore, hunt, and hide in. Aquarium water conditions should be standard, as for other tropical reef species. Ideal conditions are 72-78 degrees Fahrenheit (22-26 C), and a PH of 8.1- 8.4. Specific gravity should be 1.02-1.026, with a DKH (carbonate hardness) of 8-12. Arrow crabs will happily eat any kind of meat, flake or pellet food in addition to bristle worms and any detritus that falls to the floor of the aquarium. Arrow crabs are both scavengers and predators. They can be great in an aquarium for preying on stinging bristle worms and scavenging for the remains of unfinished food. But the arrow crab has a dangerous side too- there is a possibility an arrow crab will attack small, slow fish, small crustaceans, or pick at living corals. This behavior can often be controlled by keeping arrow crabs well fed, but anecdotal reports indicate that some individuals may be more naturally aggressive than others. Arrow crabs are considered reef safe, but there is always some risk to corals and other creatures in an aquarium with almost any crab species. Keep an eye out for unwanted hunting. Arrow crabs can grow as large as six inches, so they are ideally suited for medium or large tanks. In a large tank, Stenorhynchus seticornis will have plenty of room to roam around its territory, and an aggressive action toward a coral or small fish from time to time will be less likely to be noticeable. A smaller tank may make the aggressive behavior more likely–and therefore cause more problems. Arrow crabs are territorial so other arrow crabs in the tank will not be tolerated. In addition, some larger, more aggressive fish such as puffers may prey on the arrow crab. In their natural habitat, the coral reef, arrow crabs are not only predators but are also food for all manner of larger creatures. To hunt their invertebrate prey and scavenge in safety, arrow crabs do so under cover of darkness. They are nocturnal, so you aren’t likely to see them traipsing around the aquarium by day. If they choose a hiding spot that’s somewhat visible, they can still be observed during the day, and their beautiful slender forms can add a nice texture or peek-a-boo element to the aquascape. During the night, the arrow crab will be seen patrolling the tank, looking for morsels of meaty remains or hunting bristle worms. 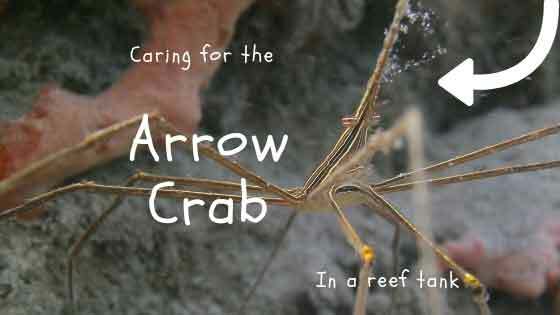 An arrow crab is quite easy to care for, so long as it is matched with an environment, other species, and habits of care that are suitable. Due to their territorial nature, arrow crabs have been considered, so far, to be very difficult or even impossible to breed in a home aquarium. Luckily, their charm has made it readily available from well-stocked pet stores as well as online. As always (especially for reef species), it is best for our natural environment to find a specimen bred via aquaculture, as opposed to live collection. Like all crustaceans, Stenorhynchus seticornis will shed their hard exoskeleton in order to grow, periodically. This process is called molting. It can be scary, for you (because it may look like your crab has died), but is perfectly normal. The empty shell it leaves behind is a used exoskeleton, not a dead crab. The shell should be left in the aquarium so that the arrow crab can eat it, to use the minerals to build its new exoskeleton. The crabs also harvest minerals from the water to help build their exoskeletons, so DKh levels are especially important, as they are for all shell-building creatures. The arrow crab is a beautiful animal, with a striking shape and flamboyant stripping. Just a watching them maneuver on its stilt-like legs in the aquarium is entertaining. Watching it hunt around the tank, and manipulate its prey or food with its outrageously proportioned claws is even more interesting. This is a truly alien-looking creature, sure to wow you and any visitors to your undersea world. With the right tankmates and good care, the arrow crab can be an excellent addition to your collection. What are your thoughts about keeping the arrow crab? Please leave a comment below.